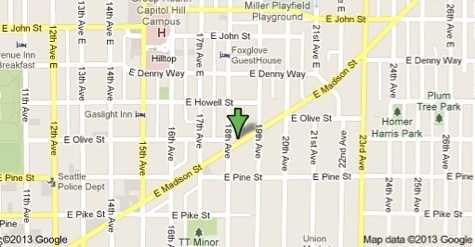 My office is located in the Capitol Hill neighborhood of Seattle at 1812 E. Madison Suite 30. The office is located near bus lines for 11,12, and 84, and has available parking. Driving from I-5 North, take the Madison Exit. Turn left on 18th Ave East. Driving from I-5 South take the James Street Exit, turn left on Cherry St, then left on 7th Ave, and a right on Madison St. Continue until 18th St and take a left.